Gopchang jeongol is a spicy Korean stew or casserole made by boiling beef tripe, vegetables, and seasonings in beef broth. 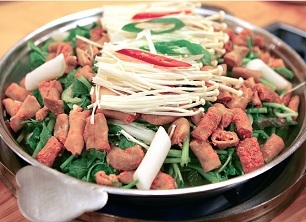 Gopchang refers to small intestines of cattle while jeongol refers to a category of stew or casserole in Korean cuisine. Although the dish is mainly based on beef intestine, other parts of beef tripe are also used to give the dish a richer flavor and chewy texture. It is seasoned with a hot and spicy red chili pepper based sauce (gochujang) and served as a main entrée, accompanied with a bowl of white steamed rice. It is often shared between several diners on the center of the table and is also a popular dish when drinking alcoholic beverages such as soju. In order to remove any odor and excessive fat in the dish, fat adhering to the intestines are meticulously cleaned out by rubbing them with wheat flour and salt. It is then washed out several more times. Since cooking gopchang jeongol requires fresh ingredients, specialized cooking techniques and a great deal of labor to prepare, this dish is generally eaten at restaurants specializing in tripe dishes.